Think of your reader as a walled city. Inside the walls are their thoughts, feelings, hopes, and insights. They have built up a lot of defenses to prevent random people from accessing those things. They want to control what comes in and out of their city. As writers we want to access that city because we want to transform it in some way. We get to choose between using a battering ram or a Trojan Horse. A battering ram is brute force: facts, figures, charts, logic, and so on. The battering ram gains entrance by overwhelming the reader’s defenses. Fiction, on the other hand, is a Trojan Horse. The reader allows a story past the defenses because of his or her desire to receive a gift—entertainment. Then we effect change from the inside. 1. Fiction accesses the emotions rather than the intellect. Many of us see the world and make decisions based largely on emotional criteria (even when we think we aren’t). Stories speak to emotion. That’s why when someone trots out all the statistics about, say, immigration, one side will respond by telling a beautiful story about an immigrant who came to the U.S. and escaped terrible suffering, and the other side will tell the story of an irresponsible immigrant who killed someone in a drunk-driving accident. Story connects us to raw, powerful emotions that can sweep right over the facts and take us to conclusions in opposition to them. 2. Story creates empathy and compassion for others. You don’t have to know a single person from Africa, or have ever been to Africa, to read and be moved by Chigozie Obioma’s The Fishermen. But you can learn about his world, about growing up in poverty and political unrest, without leaving your living room. Stories teach us about our differences, yes, but also the universal reality of the human experience as people all made in the image of God. 3. In fiction, the reader constructs their own arguments to make sense of the events. A well-written story may leave the reader to piece together what happened and why, and what led to that result—a lot like real life. A classic example of this is the story “The Lady, or the Tiger?” by Frank R. Stockton. In the story, we’re told that a princess looks down on her beloved in the arena, and there are two doors: behind one is a beautiful woman who her beloved will marry (and not be with her), and behind the other is a man-eating (literally) tiger. The princess knows what is behind each door, but her lover does not. She points to a door, telling him to open it. The question posed to the reader is, “What lies beyond that door?” The story doesn't tell us, but I’ve sat in classes where readers passionately defend the “real” ending to one another. The human response to story is to make patterns, to create meaning. 4. A good story can be revelatory to the reader . . . about the reader’s own heart. I was reading a novel by Percival Everett (pretty sure it was Glyph). More than a third of the way into the book, the narrator reveals his ethnicity. In fact, he reveals it and then says, “I bet you thought I was white, didn't you?” In fact, I had thought he was white. Because at that time, my assumption was that white was the “default.” It was a stunning moment—the author not only revealed something to me, but knew what my reaction was going to be. He had baked it into the center of the book. It—no exaggeration—changed my life. 5. Story can reveal a truth without ever stating it. I love Les Miserables, which works on so many levels and has so many profound insights that it has become rightfully beloved worldwide. It’s a deeply Christian book about redemption that is celebrated by people of all faiths. A great example of story revealing truth without ever saying it is found in what Les Miserables teaches about prayer. I may have missed one, but as far as I know, every single prayer uttered by a character in Les Miserables—prayers for protection, for justice, for provision—is answered, and often in miraculous, borderline-unbelievable ways. 6. If story is so important, why are you writing an essay? Once upon a time, there was a woman named Harriet Beecher Stowe. Distressed and angered by the political situation of her day, and particularly by the horrors of slavery, she began to write a story, which was serialized in a newspaper called The National Era. It was the story of a longsuffering Christian slave named Tom and the horrific abuses he experienced in slavery, which ended in his death. The story left no room for any conclusion other than this: Christianity was incompatible with owning slaves. When collected into a novel called Uncle Tom’s Cabin, Stowe’s book became the second bestselling book of the century (with the Bible in the #1 slot). Her book deeply impacted the people of the United States, to the point that when Abraham Lincoln met her during the Civil War, he called her “the little woman who wrote the book which caused this great war.” Her little story had literally changed the world. It’s likely Abraham Lincoln never said those words to Harriet Beecher Stowe. It was first put down in print in 1896. Lincoln scholars think it may have been invented and then propagated by professors, authors, and other people who loved literature as a way to show the enduring power of fiction. And guess what? Here we are, 122 years later, still telling that story. As for me, I wrote a story about a young woman named Madeline Oliver who has a fatal lung disease. Her friend Jason Wu has experienced a tragedy so deep that he has vowed never to tell a lie again. Together they are invited into a fantasy world called the Sunlit Lands, where they discover things about themselves and the world that would be impossible for them to learn another way. The novel, The Crescent Stone, deals with painful contemporary issues in our world without ever turning into an essay—but rather by connecting us with people we come to care about. I hope you enjoy it! Matt Mikalatos writes books (surprise!). In the past, Matt worked as a high school teacher and a comic book clerk, but currently focuses on nonprofit work devoted to helping people love one another despite their differences. He lives in Portland, Oregon, with his wife, three daughters, two unicorns, a gryphon, a dragon, and three brine shrimp. Matt, welcome to Seekerville! What a fun post and a marvelous glimpse inside why some books work for the masses... or just work in general. So good to have you here... I brought donuts/doughnuts to start the day because I just watched a police lipsinc challenge video and they had donuts.... and it was adorable... so we've got donuts to share this bright, beautiful morning! Is this your first book, Matt? A debut novel? Or is it joining friends? Good morning, Matt. Good points. Story IS everything, even in nonfiction. My daily-bread job is in journalism, and one of my tricks when I'm interviewing someone is to ask them to tell a story. This is what people relate to! Jesus told stories all the time, a practice which has been handed down to us in the time-honored "sermon illustration." And isn't His the greatest story of all? Good morning, Matt! Thank you for joining us today! So much truth in what you've shared regarding Story's ability to open inner doors. Many years ago I read that John Wayne said "You can tell people what they need to hear if you tell it in a good story." That's always stuck with me. Welcome, Matt! We're so glad you joined us today. I loved this post! I have truly been moved by works of fiction, probably more than any nonfiction I've read. I think it is because it does sneak beyond our defenses--which I had never really realized until your post! So thank you for pointing it out. Now I'll be more aware as I write my own fiction. Hi, Matt! Welcome to Seekerville today! In fiction, I love how you can connect with a story and not even be aware you are reading but experiencing everything the character does. And then you don't ever want the story to end. Thanks for a great post, Matt. To me it was a great reminder that the power of storytelling is immense. I love to read for escape but to be able to tell a story that actually changes someone's view of the world is really an amazing gift and responsibility. Thanks for stopping by and your book looks great! You've expressed the very reason why I write. I know I'll never affect anyone's thinking by trying to reason with them - that isn't my gift. Writing non-fiction isn't my forte, either. And trying to affect someone's opinion on social media is throwing fuel on the wrong fire. But like you said, the story is a Trojan Horse (I love that imagery). We might not change anyone's opinion about God or anything else, but at least through story we can show our readers a gentle argument for the truth. My typing is a little difficult as we're traveling to Dad's graveside service. One year I noticed one of the kids was struggling. I didn't want to preach to him so wrote a first fictional story about it. His behavior improved. It was the perfect solution. So sorry for your loss, Wilani. Good evening matt. Sounds like a good read. All my published experience is in non-fiction and humor. What I like best about non-fiction is that the fact that something really happened is a reason to write about it. Not so with fiction! Non-fiction can be stranger than fiction: fiction can't be! Please put me in the drawing. Your book has a very intriguing theme. Thank you for these points. As a new writer, I need to learn these kinds of details. As I read your post, I realized I've let my main character (who loves to read)emulate the heroes/heroines of her favorite books. So classical fiction is introduced to today's middle grade readers. 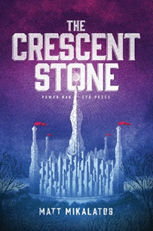 Sure, I would love the chance to receive a free copy of The Crescent Stone.